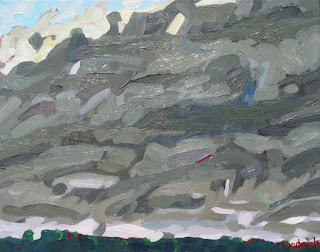 Phil Chadwick's Art: #0633 "Angry Stratus"
I am a morning person so I get to see scary clouds like this. Away from the ocean and advection fog, radiational fog like this tends to be an overnight phenomenon. A night time of cooling and moisture from the late summer drying crops is all you really need. This case is special because of the winds aloft. Stratus is just fog lifted off the surface. Early morning stratus can look a bit ominous especially if the winds at the top of the boundary layer are strong as this. Blustery northerly winds were really stirring the stratus which was quite thick and dark. The morning sun was trying hard to penetrate the thick layer. The sun angles were also very low so this makes the clouds look all the darker. It looked angry but really this cloud is not going to do anything bad. It was actually very pleasant without the sun blistering down on me. I set up on my front lawn of Watershed Farm and looked eastward starting at 9 am. 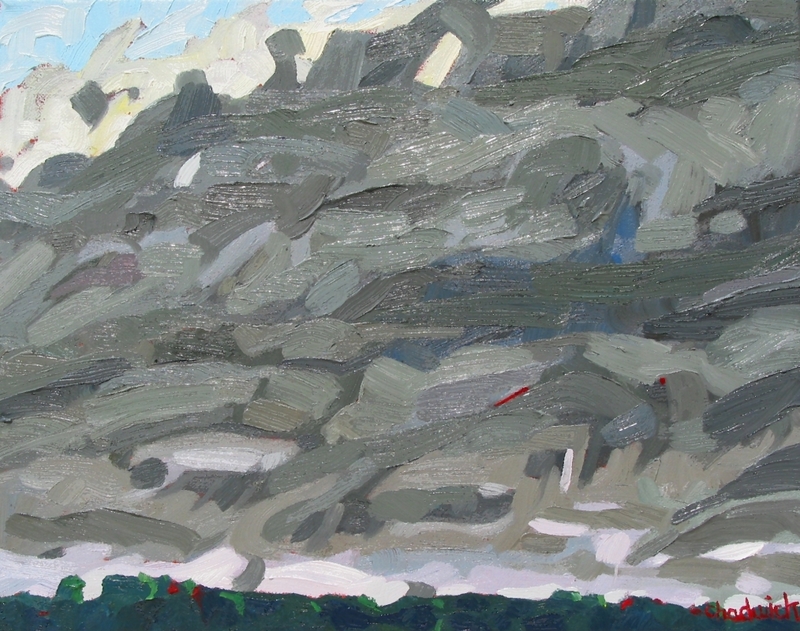 I was interested by the many colours of gray and the swirling of the clouds. The steep nocturnal inversion was still holding and there was no wind at the surface in spite of the gale blowing aloft. The subject matter might be unusual but it was all about having fun and being outside.